DEB package is officially supported by sbt. 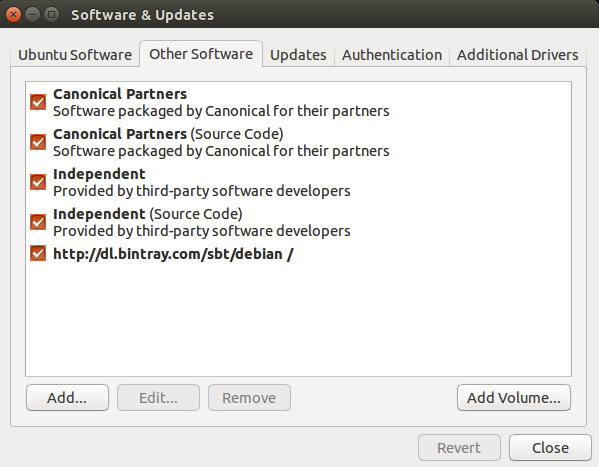 Ubuntu and other Debian-based distributions use the DEB format, but usually you don’t install your software from a local DEB file. Instead they come with package managers both for the command line (e.g. apt-get, aptitude) or with a graphical user interface (e.g. Synaptic). Run the following from the terminal to install sbt (You’ll need superuser privileges to do so, hence the sudo). Package managers will check a number of configured repositories for packages to offer for installation. sbt binaries are published to Bintray, and conveniently Bintray provides an APT repository. You just have to add the repository to the places your package manager will check. RPM package is officially supported by sbt. Red Hat Enterprise Linux and other RPM-based distributions use the RPM format. Run the following from the terminal to install sbt (You’ll need superuser privileges to do so, hence the sudo). sbt binaries are published to Bintray, and conveniently Bintray provides an RPM repository. You just have to add the repository to the places your package manager will check. Note: Please report any issues with these to the sbt-launcher-package project.